Mel Lastman was elected the first mayor of the newly amalgamated City of Toronto in 1998 after serving for 25 years as mayor of the former City of North York. Lastman formed Canada’s first mayor’s committee on child abuse, on drinking and driving, on race relations and, in 1985, on abuse of the elderly. He was a strong supporter of both charities and the arts. He campaigned tirelessly for a new downtown in the old City of North York – a $5 billion undertaking that created 70,000 new jobs and resulted in $75 million in annual business and realty taxes. Re-elected mayor in November, 2000, Lastman was quick to demand a new deal for Toronto from the Provincial and the Federal governments. He argued that Toronto residents couldn’t afford the $276 million in new responsibilities Queen’s Park downloaded any more than they can afford to continue paying Ottawa’s share of the bills to house thousands of refugee claimants who arrive here every year. Lastman met with and helped convince Pope John Paul II to name Toronto host of the 2002 World Youth Day. More than 1 million people visited Toronto in July 2002, for the celebration of peace. Waste diversion was another area of concern for Mel Lastman, who put Toronto on the road to diverting 30 per cent of its waste by 2003, 60 per cent by 2006 and 100 per cent by 2010. 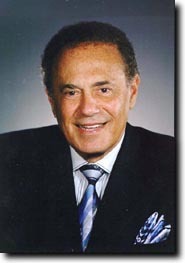 Mel Lastman gained his unique entrepreneurial talents at an early age. He borrowed $2,000 and a truck to open his first appliance store at the age of 22; before he was through, that one store had grown into a chain of 40, grossing $50 million annually. Among other accolades, Mayor Lastman has received an honorary doctorate of Laws degree from York University, a Humanitarian of the Year Award and is the only politician in Canada to be named Marketer of the Year. He and his wife, Marilyn, live in Toronto. They have two married sons and six grandchildren.